I was a little girl during WWII, but I have lots of memories so I’m going to be sharing them here, at the request of one of my commenting readers! 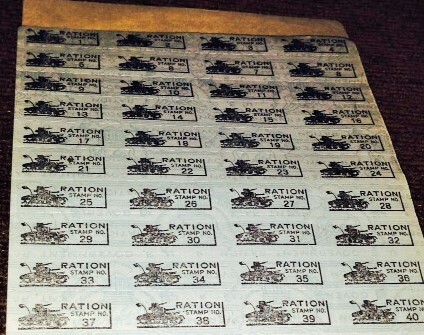 Ration stamps were a big item back in the early 40’s. Each person in the family was registered and received a book of stamps. A few products that were rationed were gas, tires, sugar, meat, silk, shoes, nylon. In our family sugar was a big item. In order to make it go around Mother devised a game for us kids. We each had our own sugar bowl with a piece of colored thread tied to the handle, for identification. I’m not positive, but my color may have been purple because that’s what is sticking in my mind. The rule was: each one had to use sugar on breakfast cereal, we couldn’t just go without, but we had to make our sugar stretch as long as possible. A prize was given at the end of the month to the one who had the most sugar left in his/her sugar bowl…I don’t remember what the prize was so I’m assuming I didn’t win! It was a tough time, but the government was doing it’s best to provide for the service men and women, both here and overseas. The manufacturing of cars and trucks was stopped from 1943 to 1945 so jeeps, planes, army trucks and tanks could be built for the war. It was a very bleak time. This entry was posted in America, Des Moines, Family, Iowa, Me, Memories, Mother, Ration Stamps, World War II and tagged America, Des Moines, Family, Iowa, Me, Memories, Mother, Ration Stamps, World War II. Bookmark the permalink. Oh you’re posting memories!! I’m so excited! THANK YOU for sharing and I look forward to seeing what memories you share! 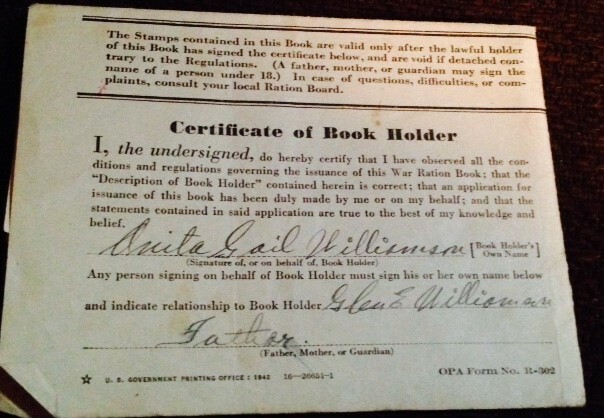 My father was born on May 7, 1945 and he received a book of ration stamps from his aunt as a gift on the day he was born. Some of them were used but, since the war was drawing to a close, most of them went unused. I have them now! I don’t have a first-hand memory like yours, Anita, but I do remember talk about rationing. Our families always had big gardens and my dad was a hunter, so I don’t remember our doing without specific types of food. Aren’t you glad you kept such memorabilia. Thank you for shedding light on a time so dim in my consciousness but prominent in our nation’s history. Thanks Marian! It’s been interesting, going back in my mind to when I was so young. Thanks for making me feel good about my writing.